The products did not undergo import re-inspection upon entry into the U.S.
H & T Seafood of Bell, Calif., is recalling approximately 71,435 pounds of imported catfish (Siluriformes) products. 14-oz. vacuum-sealed packages of PINEAPPLE BRAND FROZEN SHEAT FISH (WILD CAUGHT) with entry date to the U.S. of 1/3/18 and package code 19330 in Julian Date. 14-oz. 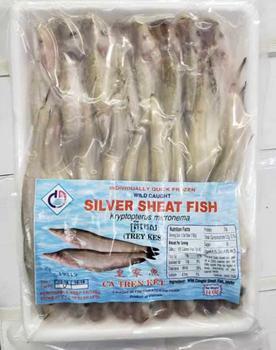 vacuum-sealed packages of TRAMAN CO. LTE INDIVIDUALLY QUICK FROZEN WILD CAUGHT SILVER SHEAT FISH with entry date to the U.S. of 1/14/18 and package code 19319 in Julian Date. 14-oz. vacuum-sealed packages of PINEAPPLE BRAND FROZEN SHEAT FISH (WILD CAUGHT) with entry date to the U.S. of 2/1/18 and package code 19330 in Julian Date. 14-oz. vacuum-sealed packages of PINEAPPLE BRAND FROZEN SHEAT FISH (WILD CAUGHT) with entry date 4/25/18 to the U.S.
14-oz. vacuum-sealed packages of PINEAPPLE BRAND FROZEN SHEAT FISH (WILD CAUGHT) with entry date 6/15/18 to the U.S. and package code 20030 in Julian Date. 14-oz. vacuum-sealed packages of PINEAPPLE BRAND FROZEN SHEAT FISH (WILD CAUGHT) with entry date 8/27/18 to the U.S.
14-oz. vacuum-sealed packages of PINEAPPLE BRAND FROZEN SHEAT FISH (WILD CAUGHT) with entry date 9/18/18 to the U.S. and package code 20030 in Julian Date. 14-oz. vacuum-sealed packages of PINEAPPLE BRAND FROZEN SHEAT FISH (WILD CAUGHT) with entry date of 10/14/18 to the U.S. and package code 20090 in Julian Date. 14-oz. vacuum-sealed packages of PINEAPPLE BRAND FROZEN SHEAT FISH (WILD CAUGHT) with entry date 11/29/17 to the U.S.
14-oz. vacuum-sealed packages of PINEAPPLE BRAND FROZEN SHEAT FISH (WILD CAUGHT) with entry date 12/19/17 to the U.S.
14-oz. vacuum-sealed packages of PINEAPPLE BRAND FROZEN SHEAT FISH (WILD CAUGHT) with entry date 4/2/18 to the U.S. and Julian Date package code 20030. These recalled products were shipped to retail locations in California, Nevada and Texas. Consumers with questions about the recall may contact Roger Kratz at (213) 309-7192.